July 10: RMF Board Meeting at 7:00 PM. Members are welcome to attend any board meeting. Check with a Board Member for the meeting location and/or agenda. July 15: Trout Unlimited Celebrates Its 60th Anniversary On this day in 1959, TU was founded by George Griffith and 14 other anglers to help preserve, protect, and restore trout streams in America. Trout Unlimited has more about these historical events. On the west side of the Continental Divide in Rocky Mountain National Park is the origin of the Colorado River. Nestled in the pines is the meandering creek that begins a mighty river. Join us for eager brookies and the occasional cutthroat. Contact host Dennis Cook. 2018 Camper “reading” the waterThis summer we will sponsor our 10th Annual non-resident camp, running from July 29 through August 3, 2019. Our Youth Outreach Camp is an intense six day program for fifteen students to learn about resource conservation and about fly fishing. It is also a great opportunity to volunteer to ensure that the next generation continues to care for the cold water resources as we do. Application process begins early March 2018. See the 2019 Camp page. If you would be interested in volunteering in the extraordinary program, please apply on our Camp Volunteer page. July 30: RMF Youth Fly Fishing & River Conservation Day Camp continues from July 29 to August 3. 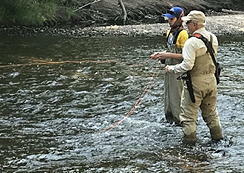 July 31: RMF Youth Fly Fishing & River Conservation Day Camp continues from July 29 to August 3.